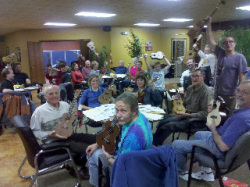 Here's a 4 minute story that TV 8 of La Crosse, WI did about Cheez Land Uke Band and it's members in March 2011. Here's the first story published in the La Crosse Tribune in late October 2010. Click on the picture to read the story that drove so many people to learn how to play the ukulele.